The chorus will be performing in concert as guests of Compass Acapella on Saturday the 30th of March at Holy Trinity Church, The Avenue, Washington Village, NE38 7LE. The concert is to raise funds towards the upkeep of the church. The concert starts at 7.30pm. A great start to the concert year with a concert to a packed house with superb singing by the chorus, Compass and South Side. I felt I must drop you a line to thank you for the most entertaining concert last night. The programme was well judged for the audience and slickly presented whilst maintaining a very relaxed atmosphere. I was especially impressed by the Ladies who showed a beautiful blend and excellent dynamic control. (And what an alto line!) Please pass on my best wishes to all concerned. I have not yet received a full accounting but we seem to have taken over £500 on the door (with tickets and raffle) which is a splendid help towards our goal of improving our toilet and kitchen facilities. 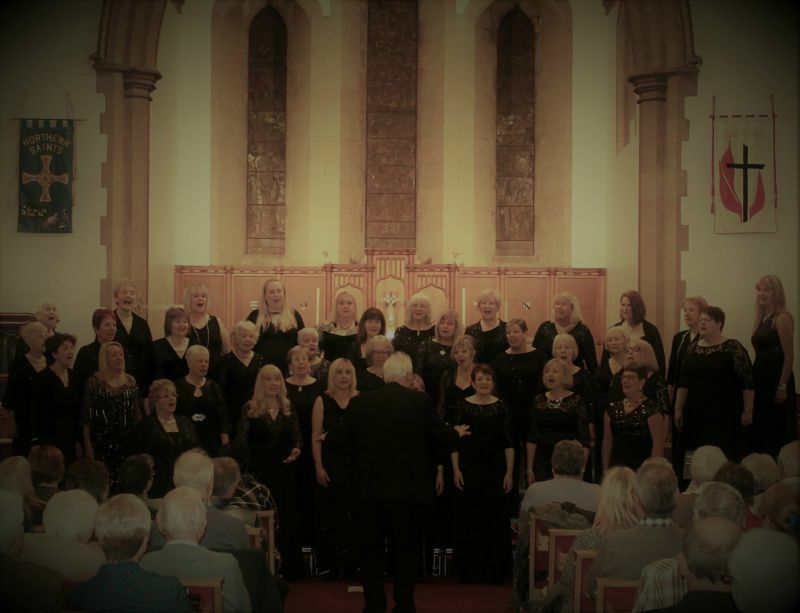 The chorus will once again be the guests of Compass Acapella at an evening concert on Tuesday the 30th of April 2019 at All Saints Church, Cleadon Lane, Cleadon, Tyne and Wear, SR6 7UU. The concert will commence at 7.30pm. Tyneside A Cappella will be special guests of Compass at a concert in Talbot Road Methodist Church on Talbot Road, South Shields, NE34 0GL. The concert will commence at 7.30pm. The chorus will be performing in concert in Morpeth Methodist Church, 1 Howard Road, Morpeth, NE61 1HU. The concert will start at 7.30 pm and all proceeds from the evening will go to the Ashington branch of The Samaritans. The chorus will be singing in concert at the Immaculate Heart of Mary Roman Catholic Church, 1 Church Way, Whitley Bay NE25 9PG. The concert is being given for the Ecumenical Society and is a return visit after a successful concert in 2017. The concert will start at 7.30pm and special guests for the evening will be Enigma. Tyneside A Cappella will join forces with Compass Acapella at Beamish Museum on Saturday the 20th of July 2019. The lunchtime concert will commence at 1.30pm in the Masonic Hall in the town centre. The chorus has been invited once again to sing at the Citizenship Ceremony at Newcastle Civic Centre at 2pm on Wednesday the 4th of September 2019. This is a private event. The chorus will be singing to raise funds for Maqcmillan Nurses in a concert to be held in St Paul's Church, Ryhope Road South, Sunderland, SR2 0HH. THe chous will be joined by guest artists Compass Acapella and the joint concert will start at 7.30pm. The choir will be performing at St John's Church, Church Road, Sheriff Hill, Gateshead, NE9 5RD as guests of Compass Acapella. This is a new venue for the choir and the concert will start at 7.30pm. Tyneside A Cappella have been invited to perform in concert at St Edwards R.C. Church, Coquet Avenue, Whitley Bay, NE26 1EE, on the 19th of October 2019. The chorus will be joined by guests Compass Acapella and the concert will start at 7.30pm. Beamish Museum - provisional date for Christmas concert. Provisional dates for charity Christmas concert.